TEN, ABC rise on Monday. With little by way of serious competition around, TEN was the leading primary channel last night with MasterChef Australia drawing its biggest numbers of the year at 1.29m viewers. That was followed by a best-ever performance from Have You Been Paying Attention? on 860,000 -both shows led the Demos. 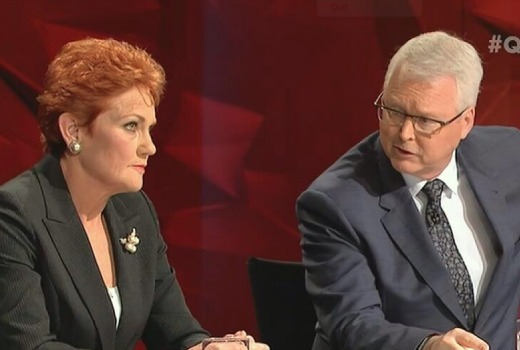 Meanwhile Q&A also pulled out big numbers anchoring much of its show around Pauline Hanson’s views on the Muslim community -to the tune of 780,000. Easily enough to win its slot. Elsewhere Seven News and ACA both won their respective slots, but Highway Patrol and Love Child lost ground. Thanks to multichannels, Seven network won the night with 26.1% then TEN 23.9%, Nine 22.8%, ABC 21.5% and SBS 5.7%. Seven News was best for Seven with 1.25m / 1.15m then The Chase (784,000 / 501,000), Home and Away (752,000), Highway Patrol (740,000), World’s Angriest (600,000) and movie: The Bourne Supremacy (470,000). MasterChef Australia (1.29m) was #1 for TEN. Have You Been Paying Attention? drew (860,000). The Project was 761,000 / 535,000, TEN Eyewitness News was 528,000. NCIS: New Orleans was 288,000. Nine News (1.05m / 985,000) led for Nine then A Current Affair (838,000), Love Child (708,000), 20 to One (645,000), Hot Seat (560,000) and The Briefcase (317,000). Footy Classified was 151,000 in 3 cities. ABC News (839,000) topped ABC’s night followed by Australian Story (792,000) and Q&A (780,000). 7:30 (733,000), Four Corners (712,000) and Media Watch (689,000) followed. On SBS it was Predict My Future: The Science of Us (184,000), The Island with Bear Grylls (162,000), SBS World News (160,000) and Tour de France (126,000). Peppa Pig pipped all multichannel shows with 344,000. TEN should give late night TV a go. I bet WIN TV are happy. Wow Tens on a roll. Always watch Hot Seat. Never watch The Chase.